Our Tuesday started out with a Mountain Top experience. After a brief meeting at the church to discuss the plans for the day, the team loaded our vans and drove to the top of the mountain in Sierra Helada Natural Park. From this location you can see all of Benidorm and the surrounding small towns. Wow, what a site to view God's creation. 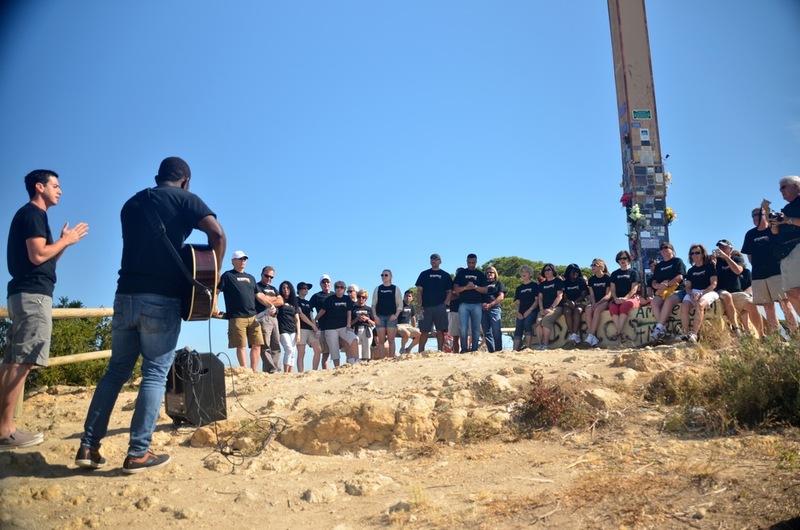 Manny explained Bruno's passionate desire to plant new churches in many of the small towns surrounding Benidorm. We sang How Great is Our God and Stuart Milne lead our devotional from 1st Chronicles which leads us to be encouraged by God and not discouraged by satan. We then traveled to the center of Benidorm where we passed out flyers promoting the festival later in the day. The flyers today were helpful written in both English and Spanish. In the evening we returned to the festival location in the park near city hall. Line dancing, face painting, bracelet making, balloon animals, rocket launchers were all there for the children and adults to enjoy. The Gospel was presented by Manny and Bruno and 65 people prayed the prayer of salvation to received Christ. Wow! Praise God!!! We are attempting to attach pictures and videos to our blog but are having some technical problems. Please continue to pray for our team and the people of Benidorm.